Macaron? Macaroon?.....Before I wrote this post I had to do a bit of research to enlighten myself to the correct name and pronunciation of these gorgeous little pastry treats pictured above. Even spellcheck seems to think that the correct spelling is with two 'o's or that I'm trying to spell macaroni! However, after checking, I have to admit that I have been making the common mistake by calling these sandwich like pastries macaroons which are something quite different entirely. 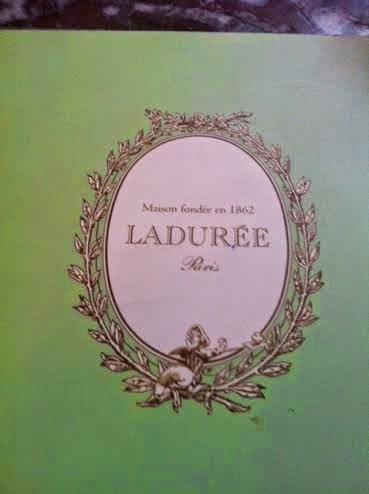 These Macarons are from the exquisite luxury pastry brand Ladurée in Paris. 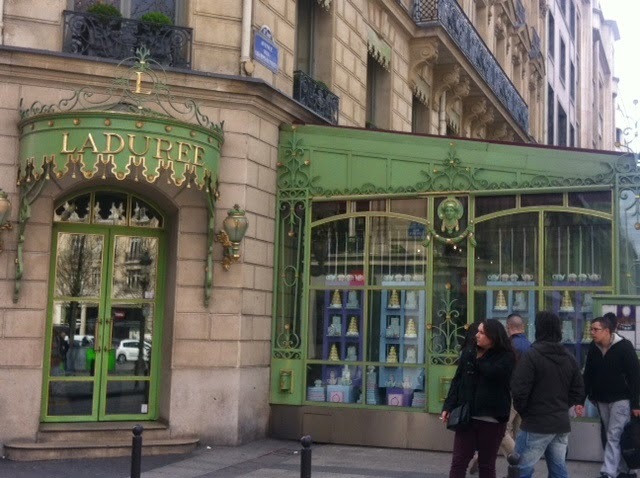 When I was there a while back with friends, we made a beeline to the Champs-Elysées where this gorgeous patisserie house landmark is based. 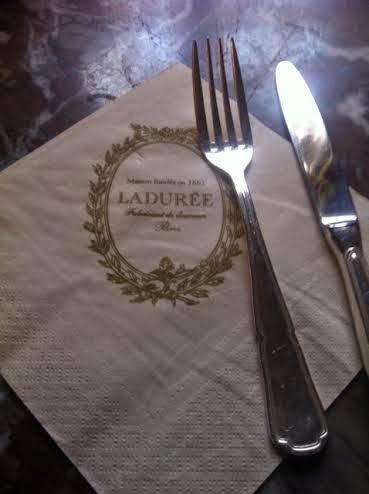 It was on our list of things we must do when in Paris. It stood out in its trademark pistachio green exterior with gold gilding and as we stepped through the doors, it was like stepping back in time to the bygone era of sophisticated and chic tearooms. It was as expected really busy inside with a long winding queue of people waiting to purchase their treats. We decided we would sit inside the tea room to really soak up the atmosphere. We were guided up the plush stairway to a small room with luxurious heavy draped curtains, traditional wall panels with oil paintings on the walls. The colour scheme and décor is all very 1920s Parisian and it really felt like I was somewhere special. 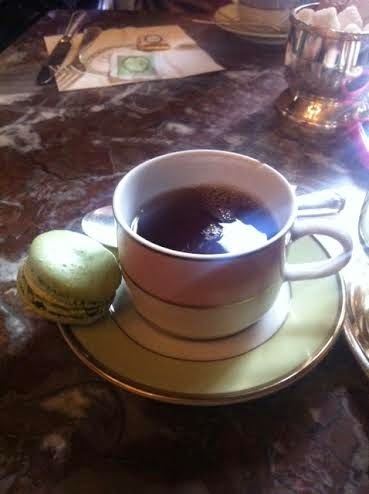 There was a large selection of different flavoured macarons to choose from the menu and they all sounded so delicious- in the end I chose a pistachio macaron to go with my cup of tea.....I could of chosen Champagne instead of tea but I am a creature of habit and besides, I was in a tearoom after all! I don't know how to describe this macaron apart from....heavenly. It was light, (so so light), full of pistachio flavour, crunchy and firm on the outside and then smooth chewy and soft in the inside. 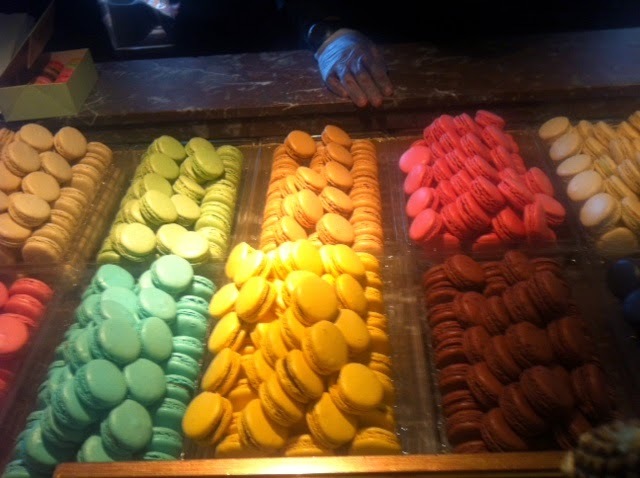 I savoured that macaron for as long as I could as I had never tasted anything like it before. 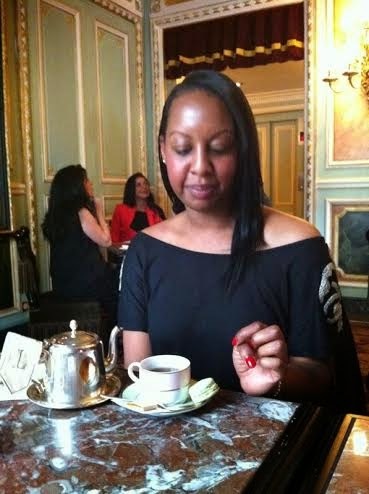 I don't know if it was the atmosphere of Ladurée contributing to the flavour experience but it really tasted exquisite! Of course, after that I queued to buy some more to take home with me. 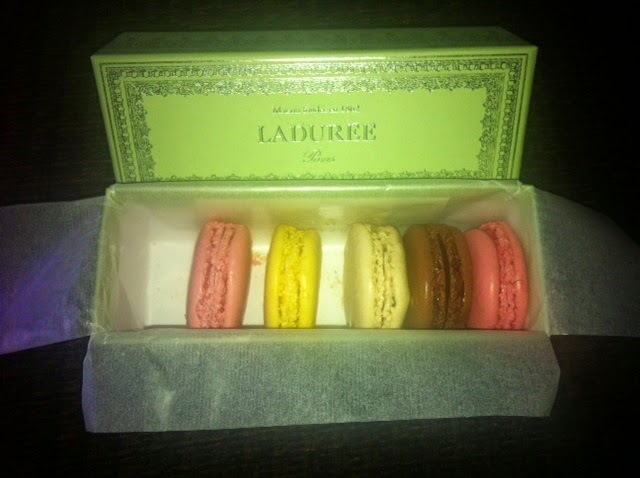 I chose Raspberry, Lemon, Vanilla, Chocolate, Strawberry and another Pistachio...the pistachio one did not make it home!! Since being back I have with trepidation tried macarons again knowing deep down that they could never match those of Ladurée. I somehow didn't want my pleasant memory to be marred by a bad macaron (so dramatic!) so good of an impression and experience I had in Paris. They were from Marks and Spencer which means of course they were not freshly made that day but in all honesty they weren't actually too bad. The flavour wasn't as impactful but still ok with a mug of PG Tips! As Ladurée is now a worldwide chain we have one in London's Covent Garden which was the first destination it branched out to. The exterior although it is in the trademark colours is nowhere near as impressive as the Champs-Elysées original and I've heard the macarons aren't as good here either, though I'd be surprised as I'm sure they use the same traditional recipes and techniques....but I guess you can't really beat a true Parisian patisserie. If you haven't done so already, treat yourself and try these gorgeous treats-you'll be glad you did. I have got a busy weekend over the next couple of days with a dear friends birthday celebration to attend so I will be back on Monday with a new post.